3 years & up. Make your artwork eye-catching with a rainbow of colors and textures! Draw your picture, outline it with a black marker, spread the glue, drop materials onto the glue and let it dry. 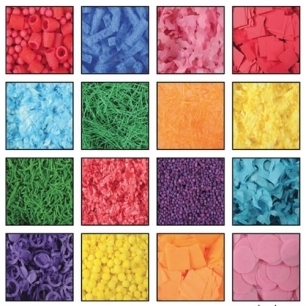 Your child can also sort and classify the materials,build a descriptive vocabulary, and develop sensory awareness with this large variety of collage materials. Includes 20 sensory art packs.